Alfalfa's Market - Get Involved. Make Friends. Enjoy Motherhood. 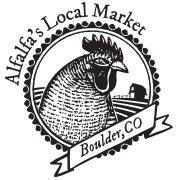 Alfalfa’s Market has a long history in the Boulder County community. We work hard daily to continue our commitment to community and product standards. We focus on local, organic, and great tasting food the same way our founders envisioned in the late 70’s. Our customers rave about our selection of fresh, local and organic produce, tantalizing housemade culinary items, unparalleled cheese selection and a butcher that sets the standard for grass-fed and organic meats, which never contain hormones or antibiotics. We are the original best-in-class natural food store, and we continue to provide great service and a great community atmosphere. You’re invited to join us in our welcoming cafés to eat among friends. Thank you for supporting the only locally owned and independent market in Boulder County. Your commitment to us allows us to fulfill our promises of sustainability and giving back to our community. We hope to see you soon!